In late May 2018, a measles outbreak was confirmed in Rumbek Centre County, South Sudan. As you may know, measles is a deadly disease that can spread very rapidly; in fact, no other vaccine-preventable disease causes as many deaths around the world. In South Sudan, poor vaccination coverage for measles means that an outbreak can cause devastating consequences—especially for children. Medair’s Emergency Response Team (ERT) took immediate action in Rumbek, initiating a measles vaccination campaign soon after the outbreak was declared. Rumbek is one of South Sudan’s larger centres, with many surrounding communities using it as a hub. This heightened the chances of measles spreading, making the response extremely urgent. For a vaccination campaign to succeed, people in all the surrounding and remote villages must be reached, which is a difficult task during the rainy season in South Sudan. 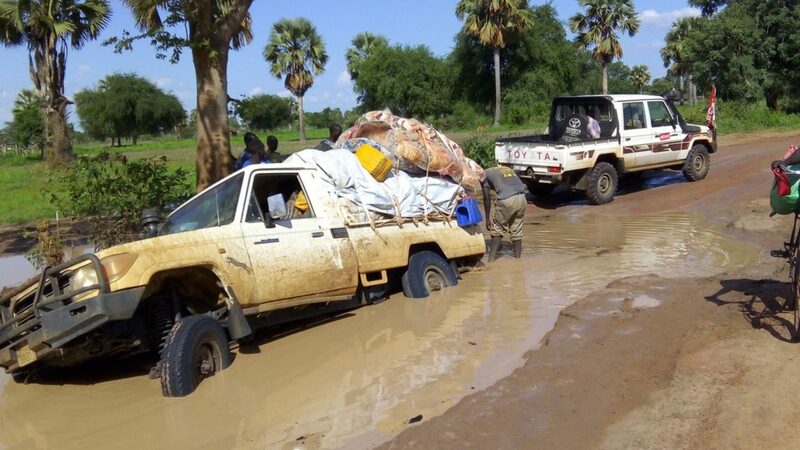 A Medair truck drives around one of the many hazards that make it so difficult to travel on South Sudan’s roads during the rainy season. The Emergency Response Health Team recruited and trained 317 local people to run the campaign. We formed 48 mobile vaccination teams of six people each plus supervisors. The campaign targeted children between six and 59 months of age and the recipients were screened for malnutrition at the same time. It was a massive campaign that required vehicles, motorbikes, bicycles, and hours of walking for each team. For the measles vaccine to be effective, it must be kept cold. Maintaining a “cold chain” in these remote conditions is logistically challenging. Eleven cold chain assistants were recruited and trained, and vaccines were carried with the mobile teams in vaccine carriers with ice packs. In areas in the county without electricity, cold boxes and ice packs were used, regularly monitored, and replaced when needed. Despite the challenges, no vaccine vials were lost due to breaking the cold chain. The campaign ran for just 10 days, during which time we vaccinated nearly 45,000 children against measles. An incredible success! 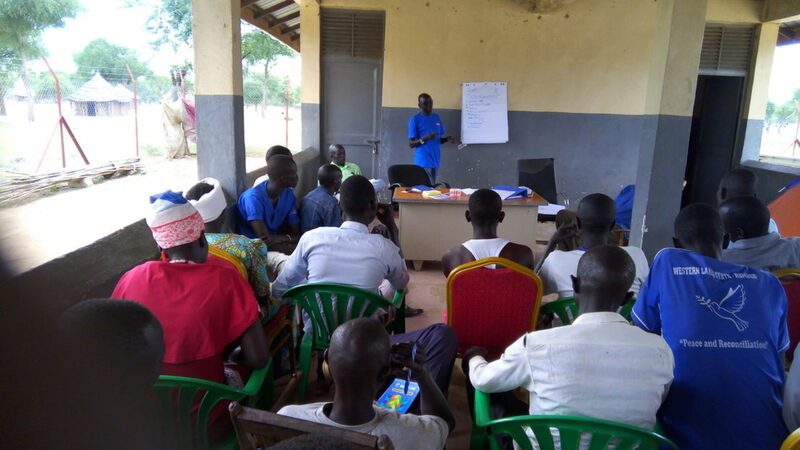 The post-campaign survey indicated a 96% rate of coverage, which provides community-wide immunity…and there have been no new cases of measles reported in Rumbek Centre County since the campaign. Your gift of just a few dollars can save a life today. One of the tragedies of South Sudan is the number of people who die each year from preventable and treatable diseases. But your gift to Medair’s Emergency Aid Fund enables people to mobilise and react quickly to disease outbreaks and to save lives. Thank you for everything you are doing to help. Medair’s work in South Sudan is made possible with support from EU Civil Protection and Humanitarian Aid, US Agency for International Development, UK aid from the UK Government, Swiss Agency for Development and Cooperation, Swiss Solidarity, and generous private donors. This content was produced with resources gathered by Medair field and headquarters staff. The views expressed herein are those solely of Medair and should not be taken, in any way, to reflect the official opinion of any other organisation. Kabra, SK; Lodhra, R (14 August 2013). “Antibiotics for preventing complications in children with measles”. Cochrane Database of Systematic Reviews. 8 (8): CD001477. doi:10.1002/14651858.CD001477.pub4. PMID 23943263.